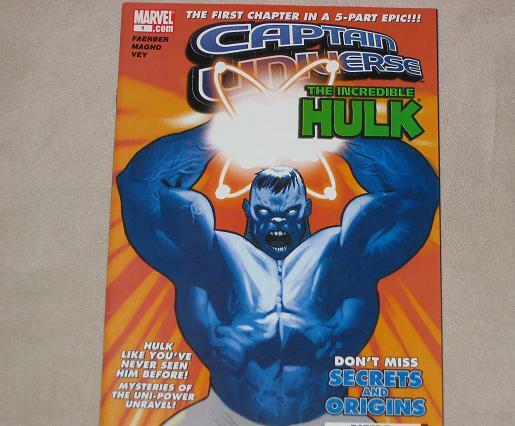 So apparently, when given the uni-power of Captain Universe, the Hulk turns blue. This is the second and only other time Blue Hulk has appeared in a comic. When wielding the uni-power Hulk has almost a sixth sense. His pants also turn white. I’m not really sure why. But with the Red Hulk fast approaching I thought showing the other Blue Hulk was quite appropriate. 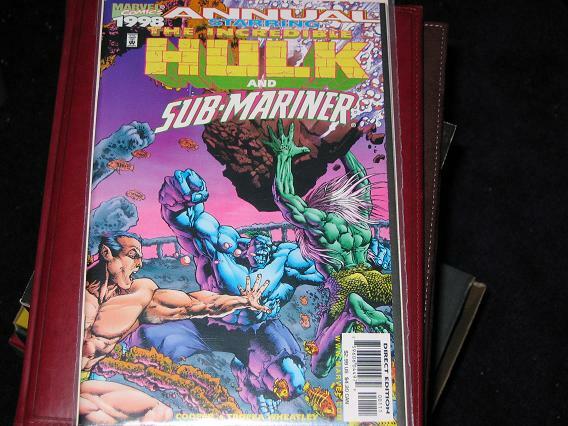 Anyways, this cover shows Hulk under the water and, yes, BLUE. May be it was the water – or maybe he was holding his breath for a wicked long time – alright, I admit it, I never read this one. I was still in shock of Peter David’s departure from writing and the fact that his last story was so amazing – the death or Betty Banner. But I thought this cover was cool nonetheless and think it’s still a noteworthy issue becuse of his color. If anyone knows why he is blue in this issue leave a comment explaining why. I guess I could read it myself now… oh, who am I kidding? I’m way too lazy for that!